2017 was an interesting year for pop music. The genre’s elite stumbled, while newcomers came through to take their place. (Or, at least, to compete for fans). Time will tell if we witnessed a changing of the guard or simply a minor correction, but one thing is clear. It’s not an easy time for established pop stars. Streaming services have leveled the playing field and taken radio out of the equation. Now, for better or worse, it all comes down to the song. And anything goes as long as its shareable. Given the changing pop landscape, predicting trends became almost impossible. (Who could have guessed at the beginning of the year that everyone would be dropping bilingual remixes in the wake of “Despacito”?) Artists that fared best were those that forged their own path. Kesha thrived in the post-genre Thunderdome, Selena Gomez reinvented herself with a Talking Heads sample and Dua Lipa climbed the pop ladder by doling out dating advice over club beats. Take a deep breath and dive into my list of the year’s best pop songs below. Just don’t pay too much attention to the rankings. They are largely arbitrary, but give a general idea of what made me press repeat the most in 2017. Pale Waves was one of the breakout acts of 2017 courtesy of shimmering indie-pop anthems like “New Year’s Eve,” “My Obsession” and “There’s A Honey.” Produced by George Daniel and Matthew Healy of The 1975, the latter stands out as the very-promising band’s defining moment to date. Germany’s Alice Merton came out of nowhere to land a pan-European smash with “No Roots,” an oddball alt-pop anthem with one of the catchiest refrains of the year. The track is starting to gain serious momentum in the US and could turn out to be a well-deserved sleeper hit in 2018. Haters will call this flop, but Lambs (rightly) acknowledge “I Don’t” as one of Mimi’s best singles. 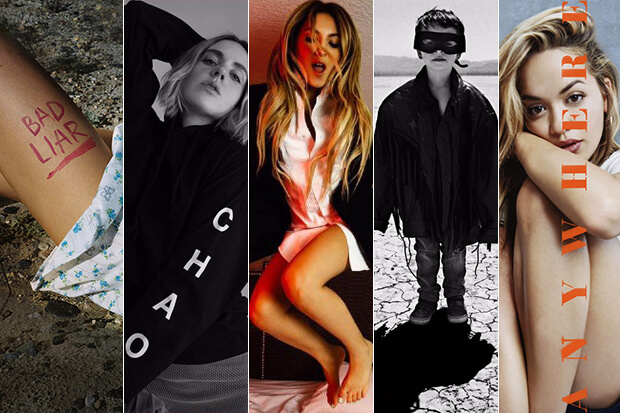 As usual, some of the year’s best pop hailed from Sweden. Leading the charge is Tove Styrke, who has set up camp at the alternative end of the spectrum. I could have just as easily included “Say My Name,” but “Mistakes” packs a little more punch. “Shape Of You” and “Perfect” (and its manifold variations) topped the Billboard Hot 100 in 2017, but Ed Sheeran’s best single of the year was actually his least successful. “Galway Girl” is a heady combination of traditional Irish sounds, sing/talk verses and a big, bold, unashamedly corny chorus. I liked it. A lot. The death rattle of Iggy Azalea was also one of the catchiest pop/rap hybrids in recent memory. Hate if you must, but this still goes harder than anything her critically-acclaimed contemporaries dropped in 2017. What’s a song without you? How do you follow the majestic, career-changing “Seasons (Waiting On You)”? By dropping another absurdly emotional, widescreen synth-pop anthem drenched in melancholy and longing. Discovered and mentored by Dr. Luke (of all people), Kim Petras was one of the biggest surprises of the year. Her debut single, the gloriously-irreverent “I Don’t Want It At All,” delivered vocals, quotable lyrics and a video starring Paris Hilton. What more could you ask for? Swedish folk duo First Aid Kit channel The Righteous Brothers on this gloriously depressing ditty and produce their best single since “Wolf.” It promises great things for their 4th LP, Ruins (due January 19). After completing his funk odyssey with “24K Magic,” Bruno Mars decided to revive New Jack Swing with the silky smooth “That’s What I Like.” Retro and yet somehow very much of the here and now, this was the crowd-pleaser of 2017. Have you just grown up and given up? Angie McMahon has the kind of voice that stops you in your tracks — even when she’s singing about a late-night food run. Happily, her debut single digs a little deeper than that. It’s a different kind of love song, one sang from the perspective of someone refreshingly cautious about new romance. Hot Fuss and Sam’s Town are two of my favorite records, but I haven’t paid The Killers a lot of attention since then. (I guess we just grew apart). That changed with “The Man,” a towering anthem that drips swagger as Brandon Flowers brags about being The Man over a ballsy disco-rock arrangement that is as gaudy and intoxicating as the band’s beloved Las Vegas hometown. Country music has been veering ever closer to pop, but LANco’s “Greatest Love Story” is more Fearless than Red (on the Taylor Swift crossover scale). A recap of a small-town romance that weathers the storm of distance and time, this should be unbearably cheesy. Instead, it’s heartwarming and wholesome in an early John Mellencamp kind of way. Whethan made a good impression with Charli XCX-assisted debut single “Love Gang,” but the teen producer really showed what he was capable of on “Sleepy Eyes.” A collaboration with the ever-brilliant Elohim, this is the kind of mellow electro-anthem that gently washes over you and leaves you wanting more. Norway’s Dagny dropped one of my favorite EPs of 2016 with Ultraviolet and then backed it up in 2017 with the cheeky “Wearing Nothing” and impossibly perky “Love You Like That.” At this point, you have to wonder what she has to do to land a radio hit. After going viral with “Fool’s Gold,” Jack River took it to the next level with “Fault Line” — a shoe-gazing lament about living life on the sidelines. Loner-pop has never sounded more anthemic. When you think of Swedish pop divas, icy synths come to mind. That doesn’t interest LEON, however. She moves further away from her nation’s signature sound on second EP, Surround Me — focussing on tender ballads instead. The best of them is “No Goodbyes,” the kind of widescreen torch song Adele would kill for. The best single by a One Direction alum by a significant margin. Every now and again, someone drops a pop song so catchy and relatable that it becomes a pop culture phenomenon. That’s the amazing achievement Dua Lipa pulls off with “New Rules,” a track so ingrained in the general public’s consciousness that its dating guidelines have become lore. After breaking big with doo-wop pop songs and Hot AC-friendly ballads, Charlie Puth would have been forgiven for churning out more of the same on his sophomore set. Instead, he reinvented himself with a biting break-up anthem complete with disco-tinged production. Most impressively, he did with without alienating the faithful. After generating huge buzz as an alt-R&B chanteuse, Kacy Hill experimented with synth-pop on the delicate “Hard To Love.” The rudely slept-on anthem was co-produced by Stuart Price and his fingerprints are all over this ethereal, electronic gem. Until this year, French Montana’s biggest pop moment was adding a little flavor to Jennifer Lopez’s (iconic) “I Luh Ya Papi,” but that changed with the appropriately-named “Unforgettable.” One listen and the chorus was lodged in your brain for days. I also love the remix featuring Mariah Carey. Astrid S was one of my pop heroes in 2017, dropping a bunch of brilliant singles as well as a killer EP and a smattering of features. The best was an appearance on Blonde’s “Just For One Night,” a deceptively sad banger about being willing to settle for whatever you can get from a disinterested lover. Mid-tempo EDM ruled the airwaves for much of 2017, which made PNAU’s bone-rattling “Go Bang” a gust of fresh air. After establishing herself as pop’s cool girl with the universally-acclaimed EMOTION, Carly Rae Jepsen threw it back to the sugary bubblegum-pop of Kiss on “Cut To The Feeling,” the best song to grace an animated movie since “A Whole New World.” It’s light and fluffy and sounds like something Kylie Minogue might have recorded for Aphrodite. Noah Cyrus was a revelation in 2017. She hopped genre with ease — churning out alt-leaning bops (“Again” is so underrated), euphoric club fodder and one of the year’s best pop/rock songs with the outrageous “Stay Together.” Radio programmers might have balked at the lyrics, but this is the kind of fucks-free, hands-in-the-air teen anthem that should have been number one for weeks. It can’t have been easy for Kelly Clarkson to turn her back on the feisty pop/rock that made her one of the most consistent hitmakers of the 21st century. Happily, her detour into R&B paid off. Meaning Of Life is a triumph — albeit one without a lot of obvious singles. The exception is “Heat.” It’s time for Atlantic to roll out this out and nab Kelly another top 10 hit. From the bristling chorus to the quirky lyrics about listening to Drake in swimming pools, The Wombats’ “Turn” is electro-tinged, jangly pop/rock at its best. At this rate, the British trio’s amazingly-titled 4th LP, Beautiful People Will Ruin Your Life, is shaping up to be something special. Just when you thought artists had documented every aspect of a break-up many times over, Phoebe Ryan goes and writes a song about the frustration that builds up when you suspect that it’s over, but you just want to be sure. Because you’re well-mannered and possibly a little OCD. I also loved the NOTD remix. After filling (excellent debut LP) Dream Your Life Away with stripped-back, micro-anthems, Vance Joy opted for a wider canvas on “Lay It On Me” — a love song with a soaring, radio-friendly chorus. This is singer/songwriter pop with finesse and heart. “Did you slip me a magic pill?” Astrid S ponders. “You got me lifted like an astronaut, no helmet on and my lungs just stop.” Few songs capture the initial rush of attraction with as much wit and perception as the Norwegian’s brilliant “Breathe.” If the absence of Robyn is weighing heavily on your soul, give this a try. UK rapper Stefflon Don really came out swinging with major label debut single, “Hurtin’ Me” — a dancehall monster with one of the biggest, most relatable choruses of 2017. This cracked the top 10 in the UK and I can’t help but think it would do the same over here with a little radio support. Yes, I know “Issues” is that song. But so is “Uh Huh.” And it showcased a fun and flirty side that I didn’t expect from Julia Michaels. If this had been released a couple of months later, I’m convinced it would have been every bit as huge as its Grammy-nominated predecessor. I say this with all due respect, but Wrabel is something of a misery merchant. Tracks like “11 Blocks” and “Bloodstain” document failed relationships in painstaking detail. Which is why “Poetry” is such a surprise. Perhaps it took someone with a bruised heart to write the most romantic, hopeful love song of 2017. MØ is the unsung hero of dance-pop. From “Kamikaze” to “Drum” (not to mention her chart-conquering features), the Danish diva always comes at the humble banger from a slightly different angle. “Nights With You” is PC Music meets exuberant Scandipop with an unexpected twist. The year’s best ode to getting high belongs to Miguel. Splish! This has been on every end of year list with good reason. “Bad Liar” established Selena Gomez as one of pop’s most daring and playful superstars. St. Vincent took a cautious step towards pop on “New York.” Co-produced with Jack Antonoff, the lead single from MASSEDUCTION is a melancholy mid-tempo ballad built around lilting piano keys. It’s softer and brighter (despite the lyrical content) than her previous work, but still as truthful and incisive as ever. Katy perry’s Witness album is polarizing, but the general consensus (at least, among the ever-knowledgeable gays) is that “Bon Appetit” holds up against the diva’s multi-platinum smashes. If only the Migos feature could somehow be expunged. Lana Del Rey came through with the best ballad of 2017 and that’s that. This is probably pop-adjacent at best, but Chris Stapleton’s joyous cover of Kevin Welch & The Danes’ “Millionaire” is the country superstar’s most accessible song to date. A simple, stripped-back tune that drips starry-eyed adoration, this is going to soundtrack a lot of weddings. The most strikingly original pop song of 2017 belonged to New Zealand’s Aldous Harding. The quirky singer/songwriter uses every octave at her disposal, swinging wildly between velvety crooning, wild shouts and jarring runs on this dreamy rumination on comprise and patience. Press play and drift off into the newcomer’s weird and wonderful world. I love every song on Kesha’s Rainbow LP, but “Finding You” is its crowning glory. This is the Your Name (the anime, not the peach movie) of pop songs, an ode to a love that plays out over several lifetimes. Simple, beautiful and moving. For someone who is technically off-cycle, Selena Gomez really delivered in 2017. I’m only too happy to join the “Bad Liar” circle jerk, but let’s take a minute to appreciate “It Ain’t Me.” Written off a generic club collaboration by some, the track’s unapologetic lyrics struck a chord with me. Breakup songs are a dime a dozen, but few capture the realization that you can’t fix people as acutely as this bittersweet bop. I have thrown (more than) my fair share of shade about Rita Ora’s vanishing sophomore LP, but the Brit got the last laugh with “Anywhere.” Sounding like a mid-’90s Eurovision entry, the perky ode to wanderlust offers sunny optimism and the best post-chorus. Possibly ever. Well played. Minneapolis duo Now, Now returned from a five-year hiatus with “SGL,” a hazy, windows-down indie-pop anthem that just happens to be my favorite song of the year. Catchy without trying, pop-centric but only just, everything about this track feels loose and authentic and destined to soundtrack a really good road movie one of these days. Listen to it in my playlist below. What’s your favorite song of 2017? Let us know below, or by hitting us up on Facebook and Twitter!